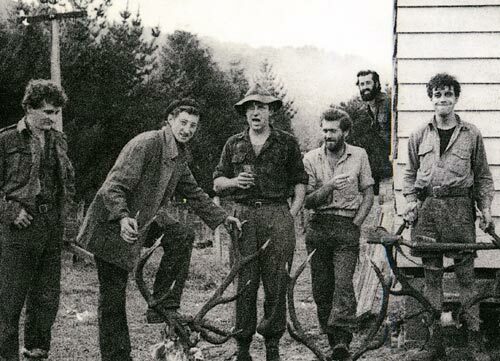 Crump and fellow deer-cullers pose with antlers – (from left) Alan Duncan, Crump, Jack Lasenby, Roy King, Bob Young and Rex Newton. In the 1950s Crump worked as a government deer culler in the Urewera region of the Bay of Plenty, and the hard-living lifestyle provided material for many of his later books. Reference: Colin Hogg, A life in loose strides: the story of Barry Crump. Auckland: Hodder Moa Beckett, 2000.